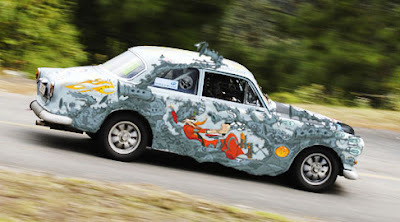 I can not think of a La Carrera Panamericana car that I didn't find interesting in one way or another, each one with a personality all it's own. Keeping that in mind there is one car in particular that will defiantly stand out more than others at this years running of the 2008 La Carrera Panamericana. The car is a Volvo 122S and will be driven by La Carrera veteran Lars Kroiss from Salzburg, Austria. You may ask what makes a Volvo any more interesting than another but after you see what has been done to this car you won't have to ask any more. The only way I can attempt to explain this would be by telling you about one of the most amazing cartoonist/artist I have ever seen. 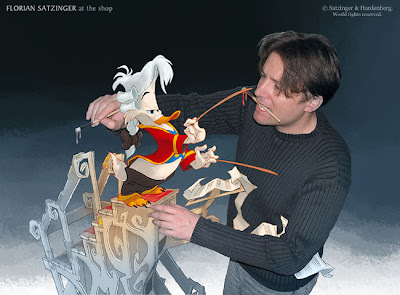 He is none other that Florian Satzinger who is one of the partners of SATZINGER & HARDENBERG Character Design Laboratories located in Austria. 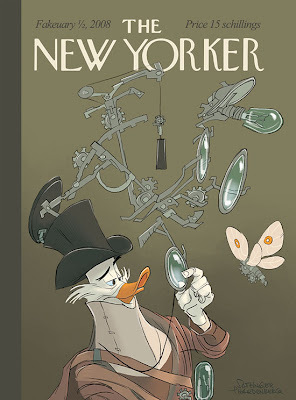 In the photo above you can see Florian at work in his studio and the one below shows some of his work featured on THE NEW YORKER very impressive all by it's self. Needless to say saying that Florian is talented would be like saying Juan Fangio was an OK driver. While corresponding with Florian he said, "My involvement is just - literally - all on the surface. 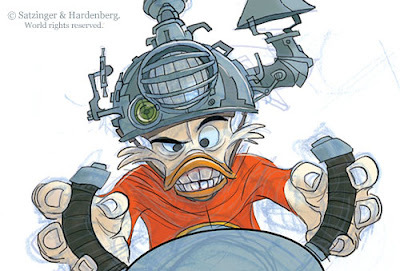 I designed the steampunkish look and the crazy cartoon duck (a character from my studio's upcoming StarDucks merchandising/toys theme: http://www.star-ducks.com ). It's a sort of sponsoring-in-kind of thing. 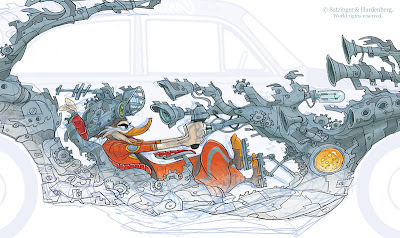 The team get's a funky car design and we get a pretty cool place to display one of our StarDucks." 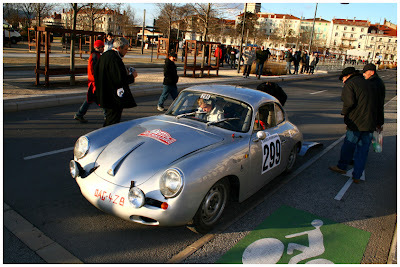 With a car like this you can be gaurenteed the spectators of La Carrera are going to get their money's worth. 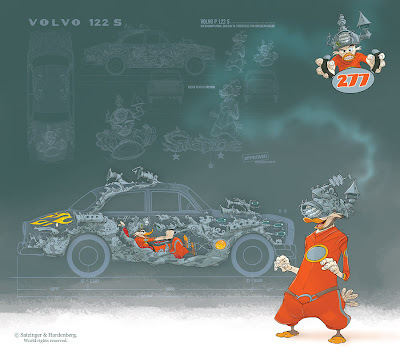 Boy would I like to see the look on their faces when they see Lars come driving into town with his "Florian Satzinger" special better know as "Steampunk Duck Racer." I can hear the Mexicans now... "It's a bird... It's a plane... No, it was a damn cartoon!" LOL. Regardless, Enjoy the photos below and I am sure we will be seeing a lot more of this car. When it's all said and done I must admit I am jealous since one of my original plans for my GT350 was to have a large "Big Daddy" cartoon monster all over the car. Bret Haller has made some big changes to his awesome THE UNLIMITED CLASS BLOG and I am sure everyone will enjoy it as much as we do. 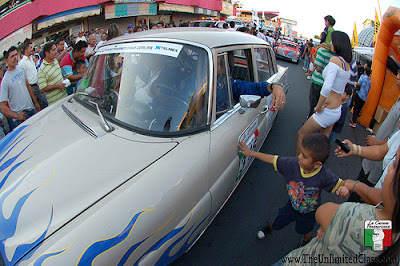 Here is his latest video from the 2007 La Carrera Panamericana that are sure to take you back in time. If you are considering being part of race history in the future or just love exciting racing you are sure to enjoy this. 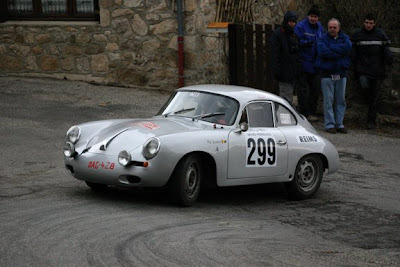 La Carrera Panamericana 2007 from CarreraPanamericana on Vimeo. Check out this race on the eastern hemisphere but more interesting might be the list of various models of cars which will be competing. My understanding is this race is put on by one of the competitors who ran last years La Carrera Panamericana. This should be interesting to watch. I must admit it would look much better with a 65 GT350 in the line up. CLICK HERE to go to the blog. On this page is a list of the cars already signed up. Boy do I ever remember what that pressure felt like as I hustled every day to meet my timeline while preparing for the 2007 La Carrera. Was it hard... At times yes. Was it worth it... Absolutely!. But for many that may be considering this years La Carrera time is running out. North American director Gerie Bledso wrote, "Right now I have 56 new guys, vets, and those from last year who said they were returning, and there's a potential of over 60. I already have 28 deposits or full payments. How many slot will we actually have? That is always a open question until June or later. Is there a real threat that the event will be sold out? Who knows. Last year they closed registration on me, but ended up with only 93 cars out of the limit of 100. By the rules, North America gets 40 slots. Last year, Eduardo Leon eventually told me to cut the list at 50, not counting the Unlimited Class. Ooops, we ran over by four." Gerie also wrote the powers that be in Mexico are not being as lenient as they have been in the past with regards to payments or the date they are paid on so for many there is even more pressure than there was in the past. Crank it up and go like hell! If it's video you thirst for then here is some older video footage from older La Carrera's that should help to wet your whistle. California's Best HD DVD will be here soon! Here is a brief taste of the high quality action packed adventure you will find on the soon to be released HD DVD as Jon, Gary and Will embark on the racing adventure of a lifetime. Besides cars there are interviews, sites and sounds and you can watch friendships form and hardships to be overcome. Come along and enjoy Mexico as we take on the La Carrera Panamericana. It's already happening... There are already several teams signed up for the 2008 La Carrera Panamericana, some friends of mine and some I don't and I see several from other countries as well. Boy are they all in for a treat and yes I am envious but prior commitments and obligations need to be fulfilled. There is already news of teams scrambling to meet time-line deadlines, some who are still trying to decide, and those who have had to deal with terms that this is not the year. As I read about each of these situations I am taken back to all those same emotions that we went through as we prepared for La Carrera Panamericana. If I had to do all over again I really can't think of one thing that I would change. I can't wait to get feedback from teams and individuals as they get set to go and all the trials and tribulations that accompany such an adventuresome undertaking and I am hopeful many of them will share them with us here for everyone to read and enjoy. Better yet I hope they will all feel comfortable keeping us updated as they leave to meet the Coyote Convoy and tell us all about the trip down south and especially the race back to the U.S.. In the meantime here are a few photos some going south and some coming back. Nothing special except to those of us who can remember those amazing days. It's hard getting up to the minute reports on Anna & Pat as they race thru the Swiss Alps in the Historic Monte Carlo but I have got some photos. 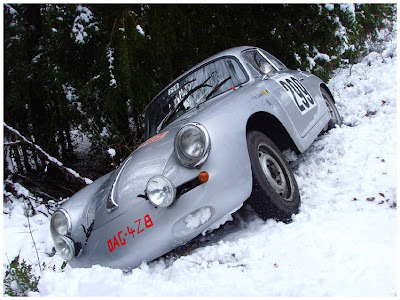 It seems because of the extremely slippery snow and ice they took a turn for the worse but they are doing fine and even the car didn't suffer any serious damage. I know they also had some engine problems but I don't have all the correct facts yet. As soon as I find out I will let you all know but in the mean time enjoy some of the great photos of their little Porsche in some amazing settings. Man do I wish I was there. I couldn't help but notice that the little Porsche is in a similar pose as Ralf's little Monte Carlo Falcon was in Mexico. I guess that's how those Swedes park their cars. After they slid off the road they heard a Volvo crash nearby but unfortunatly both teams had to wait a long time for a truck to pull them out. In the mean time the two teams had to make the best of it. Pat wrote, "In the meanwhile, we improvise a little pick-nique with the Austrians, putting together our reserves: chocolat, apples, snaps, ... And all together, the photo shows we looked quite "a happy bunch"." In the meantime I will wait to hear what I can and. It reminds me of how hard it was to keep up the reports while racing in La Carrera. Poor Internet connections, little or no time to post the reports and so on. Regardless we are very proud of our Gals in the Porsche. Meet our buddy ENRIQUE CORTES! If you are anyone you know is considering the La Carrera Panamericana and ESPECIALLY if this is your first time have I got a best kept secret for you. After the long drive to the south of Mexico we found our temporary home in Oaxaca and the very first person to greet us the following morning was Enrique Cortes. With his great big smile and friendly personality we hit it off right from the start. Little did we know that morning but before the La Carrera was over we would have a new team mate in Enrique and what has turned out to be a friend for life. 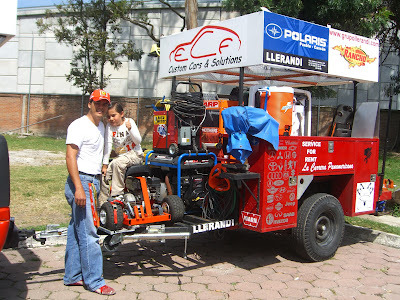 Not only is Enrique a business owner in Mexico but he's a wonderful family man as well. Enrique has a purpose built truck and trailer that he built himself that is self contained with literally everything and anything you could possibly need during this race. Not only does Enrique speak both fluent Spanish and English but in fact he has years of automotive and racing expertise. I have personally watched him work and not only is he quick, knows what he's doing and can weld anything like the pro that he is. His trailer is as awesome of a setup as you will ever see. He has welders, generator, cutters, tools, materials a virtual machine shop on wheels. If that isn't enough his trailer is also set up with a miniature go-kart which he uses to run and find parts at local parts stores and so on. He is a real go getter and he moves like a bolt of lightning so you don't have to wait around. Enrique offers his services to anyone during the race but my recommendation for any first timer headed to run La Carrera is to contact him and make arrangements for him to become part of your team. One of the advantages for us was that while Jon and I were in the race car during the day, Will, our crew chief, was able to team up with Enrique to get to the next stage on time. Since he is from Mexico and knows all the roads and the people it was extremely comforting knowing he was with us let alone in the event we needed something he could make it happen. If it's expense you are worried about worry no longer because anyone that gets hooked up with Enrique before the event will be surprised how affordable he is. Trust me on this one. If you are interested drop me a note at gfaules44@aol.com and I'll get you in touch with Enrique. I know one thing for sure, the next time I go he'll be on my team. Having the peace of mind he brings to a team is one of the best possible things you could ever ask for while in Mexico. You can't help but love this guy and there were times that we left our entire trailer and car with him at night so we never had to worry about a thing. The day we had to say fairwell to Enrique was a hard one and we can't wait until we meet again. Ever seen a piece of highway stretch out so far in front of you that it just made you want to push the pedal to the metal see what she'll do? Well, it's that's the case you are going to love running the La Carrera for sure. There are some absolutely incredible high speed stages where you get to do exactly that... hit the gas and don't let up until the co-piloto says, "CHECKERED FLAD!" For a few of us it took place during what will be most certainly be some of the biggest La Carrera history ever written as we drove flat out right thru the middle of Mexico City. Some days of La Carrera you really get to see what "endurance driving" is all about. While some of the speed sections may not seem very long by comparison there are some transit sections that are HOURS long. Even though they are transit sections there is no time to be dilly dallying so while using common sense (and the pedal on the right) you will be hauling the mail. Some of these transit sections are on tight twisty mountain roads while others find you traveling down beautiful freeways that look as if the could be in high tax county in the U.S. where the La Carrera speed limit is... whatever you want it to be! There were numerous long straights that I remember and everyone of them beautiful but there is one section in particular that stands out. My co-piloto Jon says, "Ok, this next transit section is very, very long. Oh and did I tell you it's long? Jon begins reading the route book and he says, "You're going to love this... Go straight for the next two hours." It wasn't long until we came up over a crest and there before us was sections so long you could not see the ends of them on the horizon. You just have to see it to believe it. Jon and I laugh whenever we recall that day as we remember after an hour and a half of silence when Jon said, "OK, get ready for this... Right Zero." now go straight for another hour!" And sure as hell there was slight bend in the road. I had to laugh because on the slight bend there was some skid marks leading off the side of the road as if several drivers had dozed off possibly due to the lack of attention. What a rush that memory gives me each time I remember it... cruising along with no side windows in a little 65 GT350 while doing 125 miles per hour doing exactly what I built this car to do. I couldn't help but remember a factory installed sticker in the glove compartment of my 68 Shelby GT500 that wasn't intended to be a joke. It says, "FOR SUBSTAINED SPEED OF 100 MPH FOR ONE HOUR OR MORE SEE OWNER'S MANUEL P.61." I kept remembering that sticker and telling myself, since Shelby raced in La Carrera years ago he would know what it's all about. One thing you will never hear while at La Carrera Panamericana is, "I'm bored." That word simply does not exist during that week long event. You are up so early in the morning that the roosters are still comatose and if you don't have everything laid out the night before you are going to be left behind. Before you know it there is that all familiar green flag draped down over your windshield with a countdown in Spanish. As the sound of the engine revs high and the smell of exhaust comes in the window and finally the flag is lifted you're off! Hundreds of cheering fans line each side of the road as you leave the arch and finally you can feel the engine work past the high altitude bog that is all too common during this race. First gear winds out... Second gear... Third gear.... fourth gear... Now you hear the co piloto... "Right three after the crest." It's like this for the rest of the day, over and over but before you know what happened you find yourself in the next city square and again surrounded by thousands of fans who are also screaming, waving flags and they are as excited as you are. I honestly believe in my heart that these same wonderful people of Mexico feel as if they have been in the car with you all day. When you visit with these people you hear so many wonderful stories and everyone of them is special and so full of passion. They tell you about the cars they saw last year... about the time they met a driver some years ago... about the car they have always dreamed of. But one story you hear over and over is how they grew up from the time they were little boys and girls hearing about the cars of La Carrera Panamericana. Fathers have told their children about the time their mother and father meat Juan Fangio back in the 50's or about their fathers who told them about the time they saw the amazing cars as they passed thru Oaxaca. They tell you how they have dreamed of being able to see a race they have heard about all their lives and now here we are all together fulfilling the same dream except for them it is a tradition they have grown up with. As you drive thru the huge crowds of thousands of fans who are lining the streets many parents have to hold up their little children so they can see the passing cars. It's overwhelming when you look into their eyes and see how excited they are to actually be there almost a look of "I can't believe I'm really here!" Trust me when I tell you the driver and co-driver share that same emotion. It's been over four months and we still share that feeling. I will never forget, in one town we were greeted by so many wonderful people as we came to a town square with very narrow streets which caused us to have to really slow down as they handed us gifts and a welcome lunch to hold us over for the next long transit. During this section the hundreds of fans were actually rubbing against the sides of the race cars as they reached out to try and touch our hand or the car. Parents with little children, young people, teenagers and elderly people alike all shared in this excitement and when you did manage to reach out and shake a hand or make eye contact or say hello you could see the special way in which you had affected their life. There was a lady who managed to carry her little boy who was waving a homemade American flag made from paper, glitter and stick on stars. As she got to my window she was trying to tell me something in Spanish and thankfully someone was there to interpret for me. Here little boy handed me the homemade flag and the interpreter said, "Her son made this flag and he is so excited he wants to give it to you." Quickly Jon handed me a hero card and I signed it for the boy and reached out and shook the little boy and his mother's hand. I said, "Now tell him to hang that on his bedroom wall." and the reply was, "No, he will place it on a shrine." I will never forget that little boy or his mother nor will I forget the smiles in bth their eyes. Thanks to Bret Haller we can enjoy these photos which capture images of just one of those little boys that shares the same excitement that is all too common of the thousands of children that attend La Carrera. You would think they thought Santa Claus was in every car and you know that when they go back to school all their friends will listen to them as they say, "And then I actually touched some of the La Carrera Panamericana cars just like my grand father did." I love any race car but I have to admit I am partial to anything Ford but the awesome history of the amazing Lincoln's that dominated the first days of La Carrera are without a doubt high on anyone pedestal. I love seeing the Lincoln's roll into the town square after a long day on the roads of Mexico. Every time I saw one I couldn't help but hope I would see the door open and see Herschel McGriff, Clay Smith, Bill Stroppe or Johnny Mantz come climbing out. The La Carrera affects you this way after you have been there. You race in it, you work at it, you live it, but you can never get enough of it. Since Johnny Boyd first twanged it out in 1960, and Commander Cody passed it to a new generation some 15 years later, it has been applied to everything from a primered Model A to the forgotten LSC coupe of the Eighties. But the real, honest Hot Rod Lincoln was actually a series of remarkably stock Lincoln Capri hardtops that pulled Ford out of a self-imposed exile from racing that had lasted more than 15years. It was a glorious return for Ford, as a factory Lincoln-Mercury team eventually rose to dominance in La Carrera Panamericana, the fabled Mexican Road Race, the very last of the great long-distance competitions to be contested on public highways in North America. This Capri, which won the event's final running in 1954, was the race's top-finishing stock car, albeit in the hands of an unheralded privateer who hung on after Lincoln's factory juggernaut came to grief. 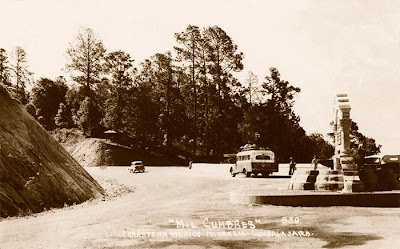 In its earliest concept, the Carrera Panamericana was born as something of a national holiday, a world-class race to commemorate the opening of the Pan-American Highway in 1950, by today's standards a primitive strip of blacktop that snaked and arrowed its way through mountains and across deserts between the U.S. and Guatemalan borders. Run south-to-north from Tuxtla Gutierrez to Ciudad Juarez just south of El Paso, Texas, the Carrera began as a stock car race, with most of the entries adhering to NASCAR's year-old Strictly Stock rules. The winner, in an Oldsmobile 88, was Hershel McGriff, who continued racing until he retired in 2002 at age 76, and the lineup also included NASCAR founder Bill France, Sr., who partnered with Curtis Turner in a Nash. Also in the 123-car field was Long Beach, California, mechanic Bill Stroppe, a sycophant of the cam-grinding prodigy Clay Smith, arguably America's first post-war team-organization savant. 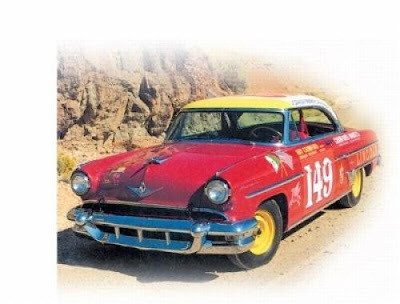 Stroppe and Smith were maintaining the Carrera entry of Johnny Mantz, who had won the first NASCAR Southern 500, a 1950 Lincoln that was the personal car of Inglewood, California, Mercury dealer and speed enthusiast Bob Estes. The Mantz-Stroppe team was hampered by blown tires and Montezuma's Revenge. But Stroppe was determined to come back. He would partner with Troy Ruttman in 1951, who, with Smith, would finish fourth in a Mercury lifted from a used-car lot. In 1952, Smith and Chuck Stevenson would team for fifth overall in a Stroppe-prepared Lincoln Capri, the first stock car to finish. Stroppe parlayed his relationship with Estes into a meeting with Lincoln-Mercury general manager Benson Ford, and left with a commitment for a factory-backed Lincoln team to contest the 1953 Mexican Road Race. It would mark Ford's first official race since its team of flathead-powered Millers embarrassingly fell out of the 1935 Indianapolis 500. Stroppe was loaded for bear in 1953, and mounted a four-car assault with some of America's most feared drivers in the seats: Mantz, Stevenson, Walt Faulkner and Indianapolis 500 winner Bill Vukovich. Lincolns, including privateers, amounted to 22 entries and swept the top four stock car slots, led by Stevenson. 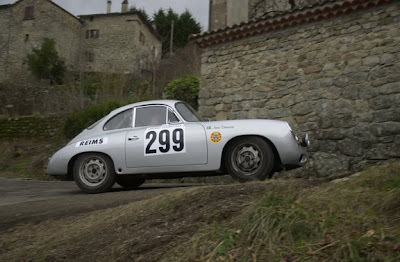 By this time, the Carrera had bloomed into a truly world-class event despite its antediluvian geography. International competitors raced everything from brutish 4.9-liter Ferraris to tiny, 1,000cc OSCA roadsters. Umberto Magioli took the overall win in a Ferrari 375, but Lincoln swept the top four stock car spots with Stevenson again leading the way. This Lincoln Capri, now part of the National Automotive Museum collection in Reno, Nevada, was prepared for the 1954 Carrera under a pall of grief, as Smith was killed when Stevenson's runaway AAA Championship car struck him in the pits at DuQuoin, Illinois. Stroppe and future Ford racing chieftain Don Francisco undertook the preparation of six factory Lincolns and several privateer cars, one purchased by Los Angeles supermarket entrepreneur Ray Crawford, a veteran of several Carreras. Vukovich led the factory challenge. The hulking, 4,250-pound Capris were prepped to withstand thousands of frequently airborne miles that saw them dodging-or sometimes, not-boulders, burros and buzzards, to say nothing of the screaming hordes lining the course. Double Houdaille shocks were employed at each wheel. Both the 317-cu.in. OHV V-8s, rated at 205hp and fitted with a Clay Smith cam and Ford F8 truck cam followers, and the General Motors-built Hydra-Matic transmissions were dyno-tested. An additional 50-gallon fuel tank replaced the rear seat, and a two-way radio went into the trunk. Stroppe's preparation didn't anticipate that all teams would be forced to draw their starting fuel from a single tank in Tuxtla that was contaminated with sediments. All the factory cars, save Vukovich's, fell out the first day with burned pistons. Vukovich would later sail off a mountainside to end his race. At Juarez, Crawford took the stock car category over Faulkner, with Magioli again the overall winner, this time over a young Phil Hill. Few knew it as the dust settled, but the Carrera had raced straight into obsolescence. As Leo Levine recounted in his masterly history Ford: The Dust and the Glory, "The race had become too unwieldy, and crowd control was almost impossible...It was one of the greatest chapters in auto racing history, and one of the shortest." It also provided the venue for a racing resurgence by Ford, the first step in its rise to eminence over the coming 15 years. It has really been exciting to keep up with many teams who have already begun getting things ready for the 2008 La Carrera Panamericana. God only knows that when someone says they have a lot to get ready for this race they mean a LOT. One thing that really helped us at Team California's Best Racing was the very informative La Carrera memos sent out by North American director Gerie Bledso. Gerie's timely letters were most helpful with regards to helping figure out what to do next. Thanks to Gerie we were able to pay fees, reserve certain hotels, send in paperwork to the correct places in a timely fashion and so on and so on. The truth of the matter is, in retrospect, without Gerie's guidance a LOT would have gone wrong. It would be like trying to assemble a nuclear powered submarine without the instructions. I find myself really getting excited when I talk to those who are building and prepping cars and teams to get ready and it really makes my heart race. I am sure the closer it gets the harder it will be to sleep as I route for everyone that's heading down. I was both sad and elated today when I read Gerie's latest La Carrera Newsletter. 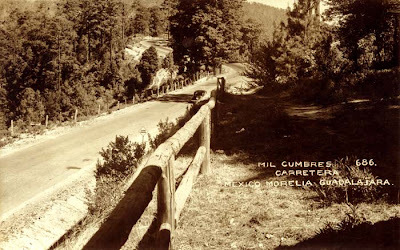 Regarding a tentative route change, Gerie wrote, "This change in the route means the race will not run, for the first time in over a decade, the mountain road called "Mil Cumbres" (one thousand peaks) or spend the night in Morelia this year." For me, this was a doubled edge sword. On one hand I was saddened to learn that none of the teams would get to see what has been considered the most notorious and dangerous and possibly the most beautiful stage of the entire race. For those first timers, don't worry, there are a LOT of exciting and beautiful stages. On the other hand for many of us that have read about the Mil Cumbres and looked at countless videos and photos let alone having run it, not running the Mil Cumbres seems almost sacrilegious. Team California's Best Racing has a special reason to have such an intimate relationship with Mil Cumbres since we are so proud of having taken the number one position on the podium during that stage. Now it seems all the more rewarding and we are truly grateful for having lived the experience and the dream. For us and I am sure for countless others, it is a memory that will never fade. 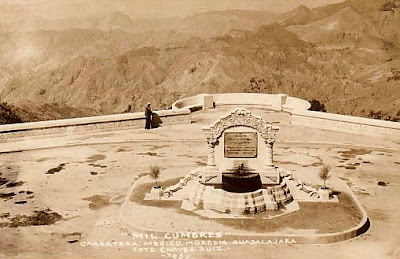 Long Live Mil Cumbres! The photos above were from the 50's and before when all the trees were logged and sent to the great silver mines of Mexico but even still you can see some of the very same beauty we saw while running Mil Cumbres. 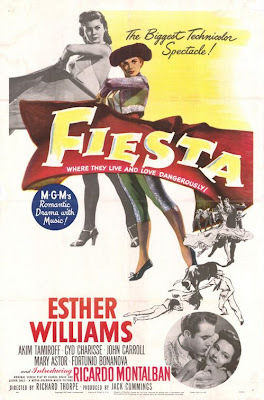 FIESTA! Where they live and love dangerously! LOL. For those of you whom for whatever reason are not on Gerie Bledso's La Carrera email list here is the most recent letter. Ron Lee has graciously volunteered to host our Carrera Fiesta among his collection of hot rods in South Pasadena on Saturday, May 10, 2008 from 5 to 8 PM. Ron's "garage" is located in South Pasadena. Among his collection is the '55 Kurtis that he intends to drive in this year's Pike's Peak Hill Climb. 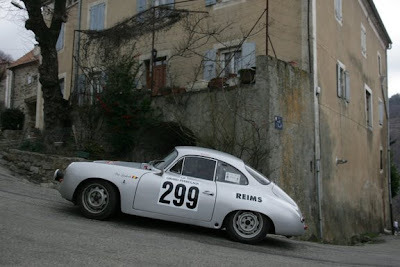 The car ran the Carrera in 1991. Instead of doing the Mexican restaurant venue, we will all chip in ($20-25) for a catered meal and Corona at Ron's. So, please mark it down on your calendar. By then, we may also be able to screen the very professional DVD on last year's Carrera being created by Gary Faules' production company. We will be taking RSVPs. So let me know if you can make it (or can't). Yesterday was spent mostly in a very high tech production studio taping interviews to be used in the new La Carrera Panamericana HD DVD along with driver's, crew, cameramen and North American Coordinator, Gerie Bledso. All three production companies were present and I am amazed how the professionalism in which this entire project is coming to a head. If we keep this up one of these days I might be able to say, "Did I ever tell you about the time I was a movie star?" LOL. It never really occurred to me how overwhelming this day would be. As I sat quietly and listened to the extremely well organized question answer interviews I found myself transported back into that period of time as if I was back in Oaxaca or that I might walk outside and see Lucky parked amid thousands of fans waiting for us to take off again. I listened while others relived specific moments during La Carrera, some exciting and some not so exciting. It was very rewarding to hear the anticipation in other voices as they relived moments that we all shared together and that many others that were involved with La Carrera will enjoy as well. Without a doubt, this is going to be by far the best La Carrera Panamericana video ever made. Both Veterans and rookies alike will love this production. Those who have been there will enjoy reliving the spirit of the event while rookies or first timers will be able to get a feel of the adventure that they are about to embark upon. Then again it will be good to watch to get ideas as to how to better prepare for their next trip to La Carrera. Thank you to all who are involved and a special thanks to Gerie Bledso for just being the wonderful personality that he his. They were all great but just wait until you see Gerie's interview. There have been hundreds of man-hours spent in editing and production and the time is coming soon when this HD DVD will be a reality. In the mean time stay tuned as we hope to release a trailer soon. In order to get your copy and to be added to the list drop us a note at teamCBR@gmail.com. Today is the big day as our good friend Anna Sorensson and her teammate Pat set off of the awesome adventure they have been waiting so long for. I can't wait to find out how that do but as so as I can I will let everyone know.